Ridgefield, Conn., September 19, 2017 – A new documentary film, Clear the Air: Opening Up About COPD, which premiered today online, presents the compelling stories of three people who are living with chronic obstructive pulmonary disease (COPD), a debilitating lung disease that affects more than 15 million Americans and is the third leading cause of death in the United States. The film was created by Emmy®-nominated director Abbey LeVine in collaboration with Boehringer Ingelheim Pharmaceuticals, Inc.
Clear the Air: Opening Up About COPD presents portraits of three real people, Bob Moss, Tina Lisenby and Mary Savord, who show strength, conviction and determination as they take control of their COPD treatment plan - which they hope will inspire others to do the same. Clear the Air: Opening Up About COPD chronicles each person’s story from the difficulty of adjusting to the challenges of living with COPD to working with their healthcare providers, family and friends to successfully navigate their lives with COPD. For the many people living with COPD, their care incorporates a treatment plan, which could include smoking cessation, healthy eating, pulmonary rehabilitation, and daily medicines, such as STIOLTO® RESPIMAT® (tiotropium bromide and olodaterol) Inhalation Spray. STIOLTO RESPIMAT is a prescription medicine used long term, two puffs once a day, in controlling symptoms in adults with COPD. STIOLTO RESPIMAT works by helping the muscles around the airways in the lungs stay relaxed to prevent symptoms, such as wheezing, cough, chest tightness and shortness of breath. STIOLTO is not for treating sudden symptoms of COPD and is not to be used for asthma. 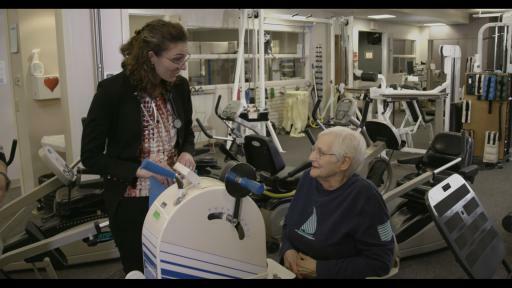 The film can be viewed at ClearTheAirCOPD.com, along with additional short videos featuring the film’s cast, and information to help patients learn more about their own COPD symptoms. The goal is to motivate and empower people with COPD to take control of their care and talk with their doctor about a treatment plan that works for them. People with asthma, who take long-acting beta2-agonist medicines such as olodaterol, one of the medicines in STIOLTO RESPIMAT, have an increased risk of death from asthma. STIOLTO RESPIMAT should not be used to treat asthma and should not be used for treating sudden symptoms of COPD. People should not use STIOLTO RESPIMAT if they are allergic to tiotropium, ipratropium, olodaterol, or any ingredient in STIOLTO RESPIMAT. As with other inhaled medicines, STIOLTO RESPIMAT can cause serious side effects, including sudden shortness of breath that may be life threatening. The most common side effects are runny nose, cough and back pain. Please see complete Important Safety Information below. Bob, a retired industrial worker and a U.S. veteran, was diagnosed with COPD in 2011. Despite a short history of smoking, his doctors believe his COPD resulted from many years of exposure to pollution and fumes. Bob lives on the island of Kauai in Hawaii with his wife, Kathy, who he met when looking for a singer to join his traveling country band. 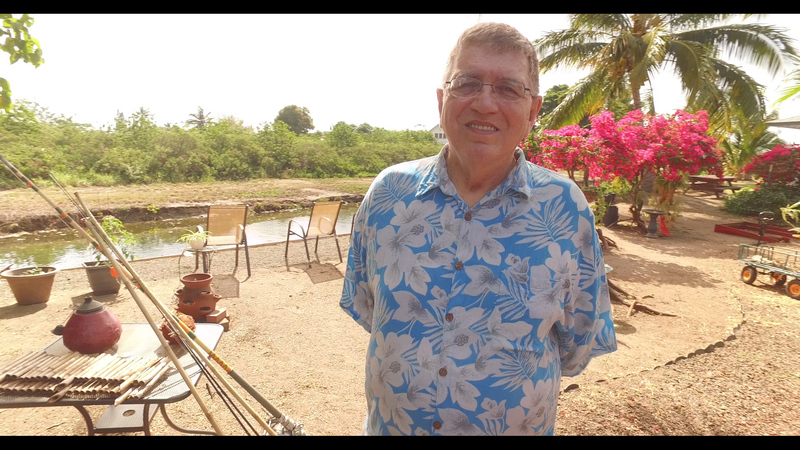 Since retiring and moving to Hawaii, Bob enjoys fishing, woodworking and playing the guitar. 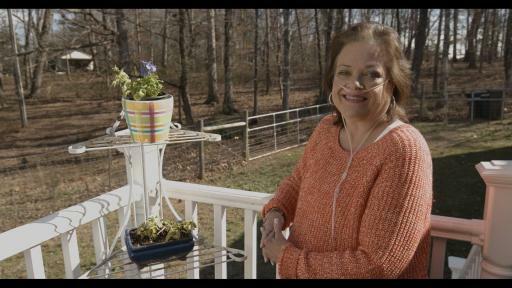 Tina, a retired university admissions officer from South Carolina, was first diagnosed with COPD in 2009. 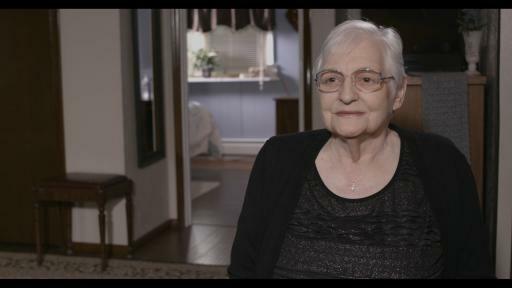 Unlike the 20-30 percent of smokers who develop COPD, Tina never smoked. She was diagnosed with the disease after being exposed to second-hand smoke by family and friends her entire life. Her brother Marc, her last living immediate relative, lives in nearby Georgia and visits often, despite her insistence that she can get by on her own. Tina remains active in her community where she plays piano at her church and leads the local pulmonary support group. Mary was diagnosed with COPD in 2001 and lives on her own in the Upper Peninsula of Michigan. Prior to learning that she had COPD, Mary had been a regular smoker. Since her diagnosis, Mary changed her lifestyle; she quit smoking, cooks fresh foods – including fruits and vegetables – and regularly attends her pulmonary rehab and support groups. 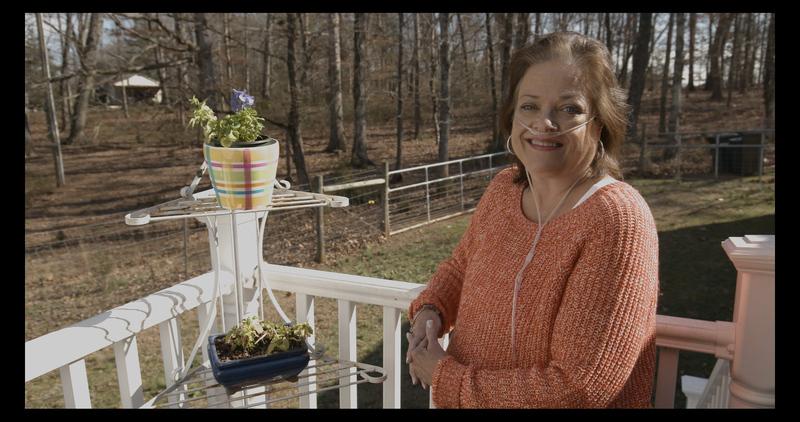 Mary enjoys her independence, which pushes her to make sure she takes the steps she needs to manage her COPD and her overall health. 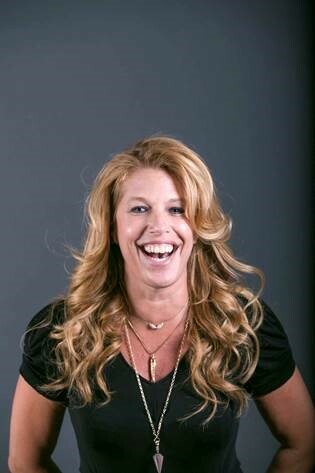 Abbey LeVine is an Emmy®-nominated Executive Producer and Director whose work over the last two decades has been viewed by millions of people on major television networks, in theaters and online. Throughout her career, LeVine has worked on a variety of documentary films and television programs where she has captured the personal perspectives of people in real-life settings, from celebrities to everyday working Americans. 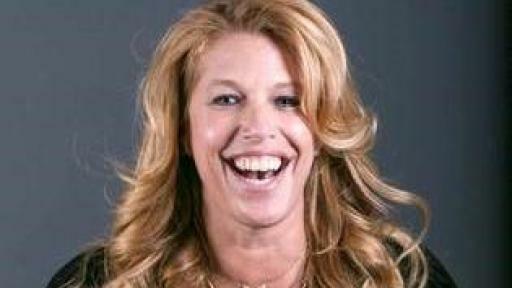 She was recognized for her work in this area for Dr. Phil with an Emmy® nomination. LeVine is personally invested in the Clear the Air: Opening Up About COPD film as her mother is living with COPD. She knows there is a growing population of people with COPD and wanted to gain a better understanding of a patient’s journey. Chronic obstructive pulmonary disease (COPD) is a term that includes chronic bronchitis and/or emphysema. This disease can make breathing harder because less air is able to flow in and out of the lungs. 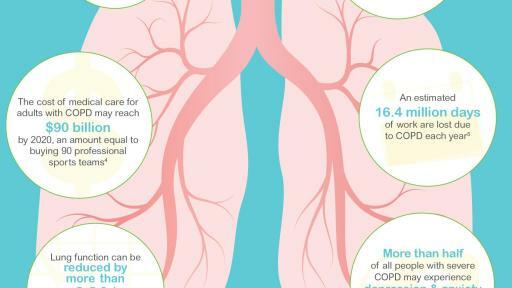 Chronic lower respiratory diseases, which include COPD, are the third leading cause of death in the United States, and approximately 15 million Americans have been told by a healthcare provider that they have COPD. The most common symptom of COPD is shortness of breath, especially with physical activities. Coughing, with or without mucus production, is also a common symptom of COPD. These symptoms can be misunderstood as signs of aging. COPD is usually associated with progressive airway damage and loss that cause breathing to get more difficult. STIOLTO RESPIMAT (tiotropium bromide and olodaterol) Inhalation Spray is a prescription medicine used long term, two puffs once each day, in controlling symptoms in adults with chronic obstructive pulmonary disease (COPD). 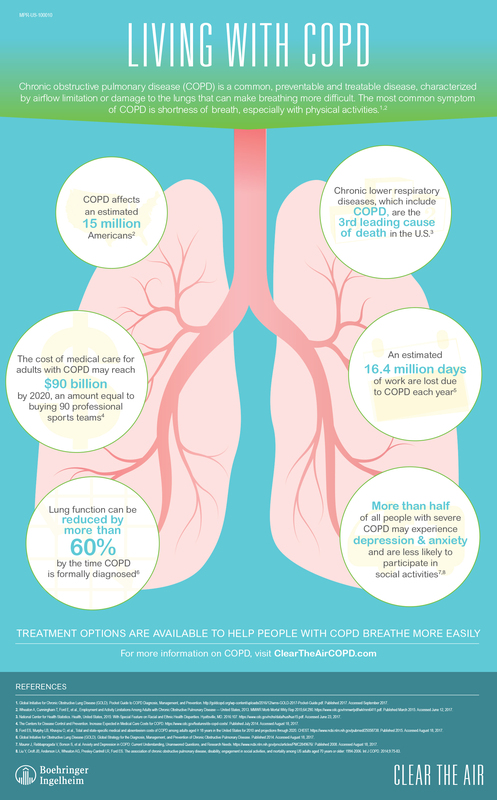 COPD is a chronic lung disease that includes chronic bronchitis, emphysema, or both. People with asthma who take long-acting beta2-agonist (LABA) medicines, such as olodaterol, (one of the medicines in STIOLTO), have an increased risk of death from asthma problems. It is not known if LABA medicines, such as olodaterol (one of the medicines in STIOLTO), increase the risk of death in people with COPD. STIOLTO has been approved for chronic obstructive pulmonary disease (COPD) only. STIOLTO is NOT to be used in asthma. Do not use STIOLTO if you are allergic to tiotropium, ipratropium, atropine or similar drugs, olodaterol, or any ingredient in STIOLTO. Symptoms of a serious allergic reaction may include rash, hives, swelling of the face, mouth, and tongue, and breathing problems. Call your healthcare provider or get emergency medical care if you get any symptoms of a serious allergic reaction. Do not use STIOLTO for treating sudden breathing problems. Always have a rescue inhaler with you to treat sudden symptoms. Do not use STIOLTO more often or at higher doses than prescribed by your doctor. Do not use STIOLTO with other LABAs or anticholinergics. Get emergency medical care if your breathing problems worsen quickly or if you use your rescue inhaler but it does not relieve your breathing problems. Call your healthcare provider if breathing problems worsen over time while using STIOLTO. Tell your doctor about all the medicines you take, including prescription and non-prescription medicines (including eye drops), vitamins, and herbal supplements. STIOLTO may interact with other medicines which may cause serious side effects. STIOLTO can cause new or worsening eye problems including narrow-angle glaucoma, and can increase the pressure in your eyes, which can cause the following symptoms: eye pain, blurred vision, seeing halos or colored images along with red eyes. If you have any of these symptoms, stop taking your medicine and call your doctor right away. STIOLTO can cause new or worsened urinary retention. Symptoms of urinary retention may include difficulty passing urine, painful urination, urinating frequently, or urinating in a weak stream or drips. If you have any of these symptoms, stop taking your medicine and call your doctor right away. Do not spray STIOLTO into your eyes.